In this “I Can Read” children’s book, a young girl has the ideal way to deal with her two young cousins who are pinching, and fighting, and biting. Tell a tale about crocodiles, and see if it sense the message home! Complete with superb Maurice Sendak images, with wonderful scowls, alligators, and frustrated cousins, we sail through an easy reader with delight. The true charm of the story lies again in the simplicity of the sentences and language. 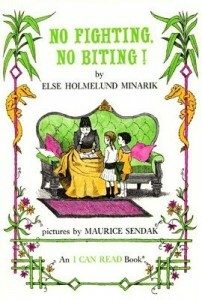 It’s a fun read-aloud children’s book, and like other Minarik/Sendak books, it aims for the new young reader, ready to master reading on their own. This one is a “Level 2” reader, meaning that some of the vocabulary and even the story line is slightly more complex. It’s also perfect to read this children’s book first with a child, so they feel comfortable with it. Then let them try it on their own. Make it fun, and kids will easily take to the pleasure of reading.